Put into practice an efficient body making method that encourages EMS movement direct to the parts of your body exposed to NARLSONIC. 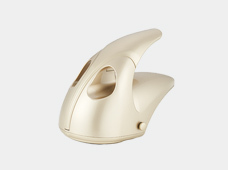 NARL P. SLIM has been designed and manufactured with the intention of providing a localized slimming synergistic effect through the joint use of NARLSONIC and EMS based on scientific knowledge from clinical studies. After or at the same time as exposure to NARLSONIC, an EMS treatment is performed to make it possible to further enhance the characteristics of NARLSONIC and concentrate on shaping up on the areas of concern. It is possible to apply the NARL Ultrasound and the EMS treatment simultaneously. It is also possible to use them separately. The pads use the adhesive gel sheets that are included. Gels and lotions are not necessary. 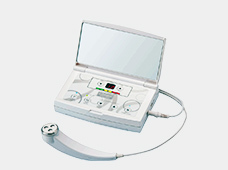 The NARL Ultrasound is effective at treating a large area by prolonged application. It is possible to connect all 4 pads that are supplied as standard by using the NARL & EMS connector pads. 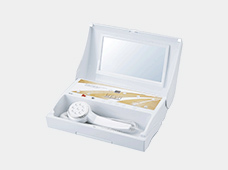 They have improved usability and they enable the NARL Ultrasound to be applied over a wider area. The current status and time of the treatment can be easily learned by looking at the lighted timer display and the LED's. 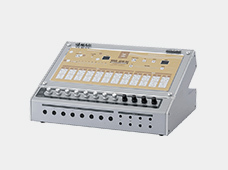 The EMS is programmed with 3 different modes so it is possible to use it how you like. There are 3 different types of wave frequencies, strengths and automatic rhythms. In muscle training you can select 'EMS Mode' or 'Relax Mode', which repeats between massaging, striking and pressing. In lymphatic massages and aerobic exercise, drainage mode is used. It is possible to select the most appropriate position and treatment mode by adjusting the output level. NARLSONIC is a scientific technology that enables shaping up of only the areas of concern that until now has not been possible by using the special weak ultrasonic waves with a frequency of 517kHz and a strength of 110W/cm2. 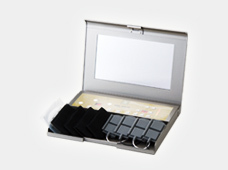 EMS is the abbreviation of Electrical Muscle Stimulation. muscles exercises the muscles independently of instructions from the brain. The EMS is electro-technology that by supplying direct electronic stimulation to the muscles exercises the muscles independently of instructions from the brain. When using the NARL Ultrasound treatment or the simultaneous NARL Ultrasound and EMS treatment, in order to achieve the true performance that this machine is capable of, please be sure to adjust the position of the pads every 10 minutes. It is possible to freely combine the EMS function during the NARL Ultrasound treatment, or vice versa, so please select the treatment style that best suits your needs.